deserves. They use the power of storytelling to change how people think and act. Change starts with you to do your bit and be a storyteller. Join Girl Rising and inspire your community to stand up for girls empowerment. "Said Amala Akkineni, Director - AISFM (Annapurna International School of Film & Media). On International Women’s Day on March 8th 2016, an awareness campaign on ‘Girl Rising’ was held here at AISFM (Annapurna International School of Film & Media) campus Hyderabad. 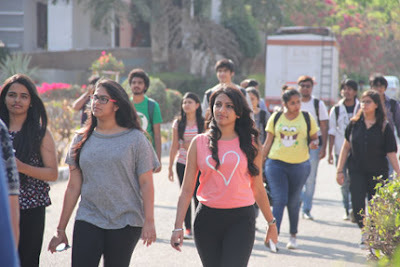 AISFM participated in full strength to show its support for the cause; students, faculty and its members, started off the event by gathering at a point, carrying placards and posters in their hands, showing their support. Be part of the solution, start here: Learn, Speak, Act!’ and ‘Educate Girls. Change the World.’ were some of the slogans on the placards, that united the group for one common cause. Later on, short films about ‘Girl Rising’ were screened, which journeys around the globe to witness the strength of the human spirit and the power of education to change the world. Viewers got to know nine unforgettable girls from around the world: ordinary girls who confront tremendous challenges and overcome nearly impossible odds to pursue their dreams. Prize-winning authors put the girls’ remarkable stories into words, and renowned actors give them voice. Girl Rising is a global campaign for girls’ education. The power of storytelling is used to share the simple truth that educating girls can transform societies. Girl Rising unites girls, women, boys, and men who believe every girl has the right to go to school and the right to reach her full potential. Girl Rising’s mission is to change the way the world values the girl. It unites all of us around a shared goal: to get more girls through secondary school and to empower them to rise. So, help create more awareness! Educate Girls. Change the World.